One of RailPAC’s missions is to respond to the Business Plans of the State Rail Corridors. We have concerns about many of the policies adopted and hope that our experience is useful in pointing these Boards in the right direction. The reality is that RailPAC has a longer history of attendance at these meetings, and knows the issues better, than almost all of the Board members. And it seems that Board members are rotated on and off the Boards more and more frequently by their member agencies. The LOSSAN Board meeting is today, we’ll see if there is any response. RailPAC is a volunteer non-profit group of advocates, many with professional experience in the railroad industry. Since 1978 we have attempted, through constructive criticism, and through advocacy at local, state and national levels to bring about a modern passenger railroad system in California and the west. We have reviewed the draft of the 2018 business plan and would request your careful review of our comments on three particular, and related issues. Punctuality: Table 2.4 of the draft indicates that On Time performance (“OTP”) at 68.8% for 2017 is the worst it has been in well over a decade. Add to that the Uniform Performance Standard (“UPS”) which counts trains that are up to 10 or 15 minutes late as on time and it is clear that fully a third of your customers are likely to be delayed or inconvenienced by this appallingly bad performance. The draft makes comforting statements about working with host railroads, monitoring performance and so on, but this has been going on since before the agency was formed and the problem is worsening. We see at least three problems here. First, the primary source for information about delays comes from the Amtrak conductor’s reports. These tell only a small part of the story. Passenger trains run according to a schedule so any reference to “passenger train interference” as a cause of delay is fundamentally flawed. One train delays another if one or both are running out of course. The question is why was that train running late? The conductors’ reports do not have that information, and so you must dig deeper. An in-depth analysis of at least a large sample of a day’s operations is required to root out where the problems are occurring and to formulate an action plan. When additional stops were introduced in San Diego County at the behest of NCTD we were informed that their performance would be reviewed. Amtrak maintained that the additional stops could be accommodated within the schedule. What they did not make clear was that stops would take away and recovery time, meaning that an early morning delay would cascade through the schedule for the rest of the day. RailPAC recommends that the morning northbound stops at Carlsbad Village and Sorrento Valley be removed from the schedule. Likewise, any southbound evening stops on a train that has a return northbound trip should be eliminated. The UPS, permitting late trains to be counted as on time, further obfuscates the problem. Minutes may be lost at stations with passenger boarding but these seemingly minor problems can accumulate to a ten-minute delay, which goes unrecorded in the statistics. Yet this train running ten minutes late can negatively impact a train in the opposite direction and cause a cascade of late running for the rest of the day. We recommend the elimination of the UPS “grace period” in evaluating and analyzing on-time performance and request that train statistics for Board reporting purposes be based on the actual recorded time against the scheduled time, i.e. that on time means on time, not ten minutes late. Only then will you have a clear picture of the service that your customers are enjoying. 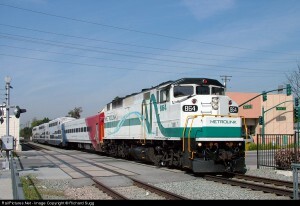 Additional trains: The draft Business Plan calls for an additional round trip between San Diego and San Luis Obispo. There is no reference in the document to any significant infrastructure improvements that will permit the efficient running of additional trains. We know some improvements are taking place but there will still be significant bottlenecks that make the schedule fragile at best. Indeed, the current projects are barely adequate to support the current level of traffic without further straining the system. We have tried to point out that, since the introduction of commuter services on the Corridor, there are too many trains scheduled on weekdays to enable the operation of a consistently reliable service. The punctuality statistics prove our point. We recommend that there should be no additional trains scheduled until significant projects such as RaymerBernson double track, and the Rosecrans-Marquardt grade separation are complete. Rolling Stock: There is no way to put a gloss on this. The State agencies have made a complete mess of passenger rolling stock procurement since the passage of 1B in 2004. In addition, CALSTA is trying to force California to adopt a high-level boarding standard twenty-five years after massive investments have been made in low-level boarding stations and rolling stock for both intercity, commuter and mixed-use stations throughout the state. I have no doubt that there are advantages to high level boarding, but there is no appetite and no funds for wholesale reconstruction of our one hundred plus passenger stations. We have to play the hand we have been dealt. The decision by Calsta to abandon construction of bi-level coaches and order single level cars should therefore be opposed by LOSSAN and the other corridors. Reference is also made to the possible acquisition of Chicago type gallery commuter cars from Great Lakes Railway. This idea should be immediately abandoned. These gallery cars are the worst passenger cars in North America, if not the world. Boarding is via steep stairs and the upper level is reached via a narrow staircase. The cars were designed for the convenience of conductors checking tickets, and are noisy, uncomfortable and totally unacceptable for service in this corridor. Staff should be directed to cease any attempt to acquire these cars. procurement program is revived and put in the hands of professional management. We also understand that some former ATSF cars, an early version of the Superliner, may be available and this option needs to be explored. Photo by Richard Sugg, RailPAC member. The sensible approach for LOSSAN is to focus on the rolling stock and punctuality issues for the next two years. If Surfliner compatible cars can be acquired, then existing trains can be augmented. New locomotives should improve reliability and to some extent train performance. Any idea of adding trains to the schedule should be put on a back burner until On Time Performance is radically improved. The focus of the Board should be to persuade their member agencies to allocate funds for double track and other improvements in the right of way, and to ensure that these funds are spent once they are available. RailPAC congratulates the LOSSAN staff for its efforts to better market the Surfliner service under difficult conditions. We trust that the Board will set realistic objectives and at the same time set out a vision for a modern passenger rail corridor that will meet the needs of Southern California.